Learn the safest ways to completely defrost turkey, and also make sure you start the process soon enough to get your bird ready for Thanksgiving Day. You're all ready to have a big Thanksgiving celebration, and as part of the plan you bought a big frozen turkey. Now the big day is arriving and your mother asks, have you started thawing your turkey yet? The answer is yes, you should. The bigger your turkey the longer it will need to thaw, especially if you want to do it safely. That means planning ahead so that you give it adequate time to thaw, somewhere in the range of 2-4 days, depending on the weight of your turkey. This is something critical, but often overlooked in planning for Thanksgiving Day. 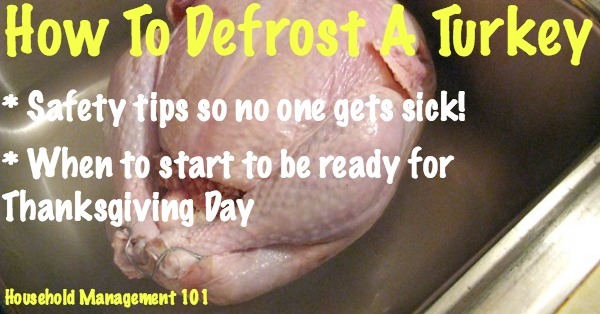 There are two good ways to safely defrost turkey that is frozen, in the refrigerator or in the sink. You can also do it a third way in a pinch, in the mircrowave, but I don't recommend it. Never thaw out your turkey at room temperature. This is a way to get your whole family sick on Thanksgiving, from a food-borne illness, which would not be a great way to give thanks. Before I discuss these various method for defrosting turkey though, let me explain why you want your turkey to be completely thawed before you cook it. Turkey, like any type of poultry, can harbor unsafe bacteria which can cause food-borne illness if not cooked until the proper temperature to kill it has been reached. Generally, the directions on the package of the turkey will say how long to cook the bird, based on how much it weighs. These estimations will be wrong if the bird is not completely defrosted by the time you start cooking it, meaning the interior of the turkey may not reach the temperature necessary to kill all bacteria by the time you think it is done. How Far Ahead Should I Begin Defrosting? The amount of time needed varies for each type of defrosting method listed below. But for my recommended method of thawing out your turkey in the refrigerator, give your turkey 24 hours to defrost in the refrigerator for every five pounds. 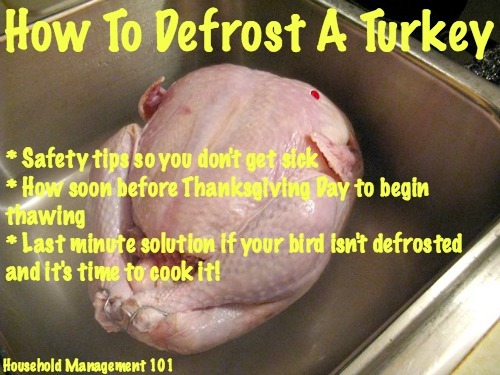 In addition, the turkey should not be in the process of defrosting for more than 4-5 days maximum. What this means in practice is that a 10 pound turkey will take 2 days to defrost in your refrigerator for example. 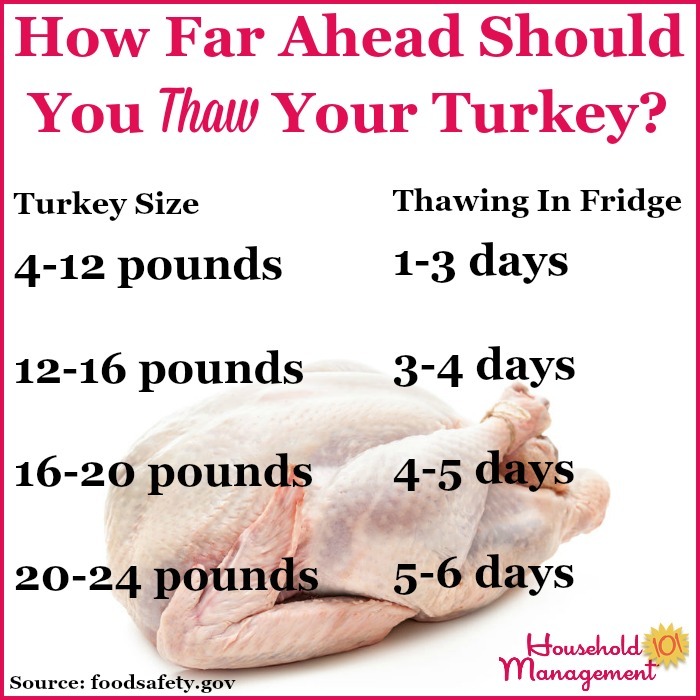 If you're brining your turkey after it thaws, make sure to take that time in mind as well when figuring out how far ahead of time you should take it out of the freezer! The best way to thaw your turkey is to plan ahead, and defrost it in the refrigerator. The reason for this is that it will get warm enough to thaw, but not so warm (above 40° F) that bacteria can begin to grow and cause food safety problems. 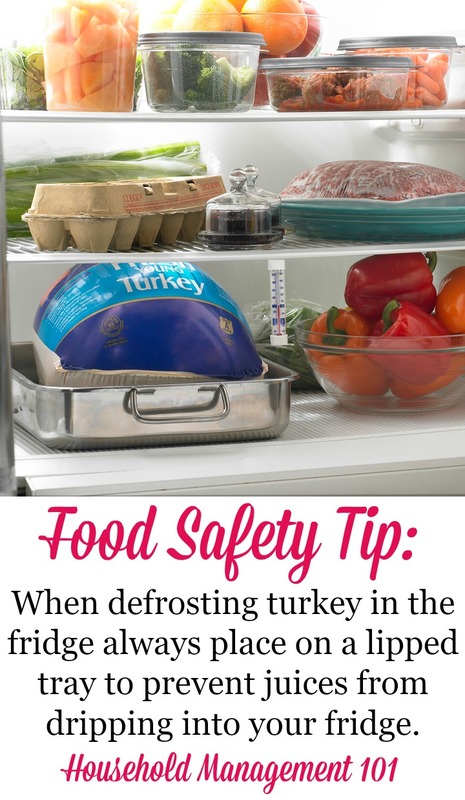 Keep the turkey in its original packaging while defrosting it in the refrigerator, and keep it on the lowest shelf so it cannot drip onto anything else. Also, even with the packaging on as you defrost turkey it will begin to drip. To keep raw turkey juice from getting everywhere place your turkey on a lipped tray to catch any juices. You definitely don't want to try to clean this up, and ruin a bunch of food it has dripped on in the process right before the big Thanksgiving meal! Another way to defrost turkey is in cold water in your kitchen sink. This method takes less time than in the refrigerator, but is more labor intensive and can still take quite a while if you have a really big bird. Again, keep the original packaging on the turkey during this process. You may also want to put it in a leak proof package, to make sure water does not seep into your turkey, which will make it not taste as good, as well as potentially introducing bacteria into the bird. Place your turkey in need of defrosting in the sink and fill up the sink with cold water. Allow 30 minutes of soaking for each pound of turkey, and you will need to change the water every 30 minutes to ensure the water stays cold. You will also need to immediately cook the turkey after it defrosts in this manner. If you've realized too late for one of the other methods that you still need to defrost turkey for Thanksgiving dinner, you can also thaw it in the microwave. However, I really don't recommend this method, because it really dries out the turkey and it won't taste as good. To do it though you need to first remove the packaging, including the packaged parts on the inside. You definitely don't want the plastic to melt inside the bird. Then, read the directions on the package of the turkey, and also your microwave to determine the instructions based on the size of your bird, the minutes per pound, and also the power level that you should defrost it on. Here is a video that also gives instructions for how to thaw your turkey to make sure it is ready for you to cook on Thanksgiving Day. When removing the giblets from your turkey make sure there are no longer any ice crystals in the cavity of the bird. You can also poke the thicker portions of the turkey with a fork. If it gives it has thawed, but if it is still hard it needs to thaw further. Want to know even more about thawing a turkey? If so, check out my friend Marybeth's tips for how she thaws her bird each year for Thanksgiving!